Posted by Tantumblogo in Basics, disconcerting, episcopate, error, foolishness, General Catholic, Interior Life, Papa, Revolution, sadness, scandals, shocking, Society, SOD. I don’t know what I think about this. I’d say rebuttal might be better than avoidance, since he’s already blasted Pope Francis’ stand on climate change (so he can’t be excusing himself to prevent being seen in opposition to the Pope). At any rate, the wheels seem to be coming off. This is a sort of unprecedented development, is it not? Well……discuss. I’m well and truly out of time. Sorry posting was so short today. Work is getting busy and will be for a while. Meanwhile, the TFP petition to Pope Francis to PLEASE, PRETTY PLEASE, WITH SUGAR ON TOP! defend Catholic Doctrine is up to 626,000 signatures. Post material for next week: at what point should traditional Catholics forgive groups that may have had an awkward or problematic past? I’ll list a few specific examples in the post, but TFP would be one of them. Yes, they got a little bit nutty, especially in Brazil, in the 80s/early 90s, but since their founder died seem – seem – to have settled down. Anyway, more on Monday. Posted by Tantumblogo in awesomeness, Basics, Flightline Friday, fun, General Catholic, non squitur, silliness, technology. Well this is a pretty interesting revelation. 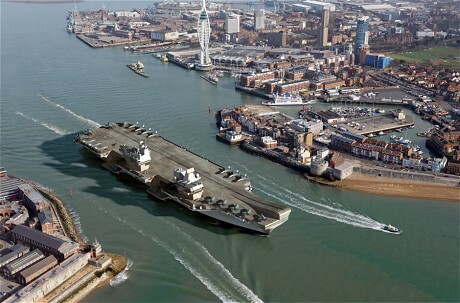 The Royal Navy has really put all its eggs in one – err….two – baskets, two new relatively full-size carriers that have been under planning and construction since the “Strategic Defense Review” of the Tony Blair government back in 1998. 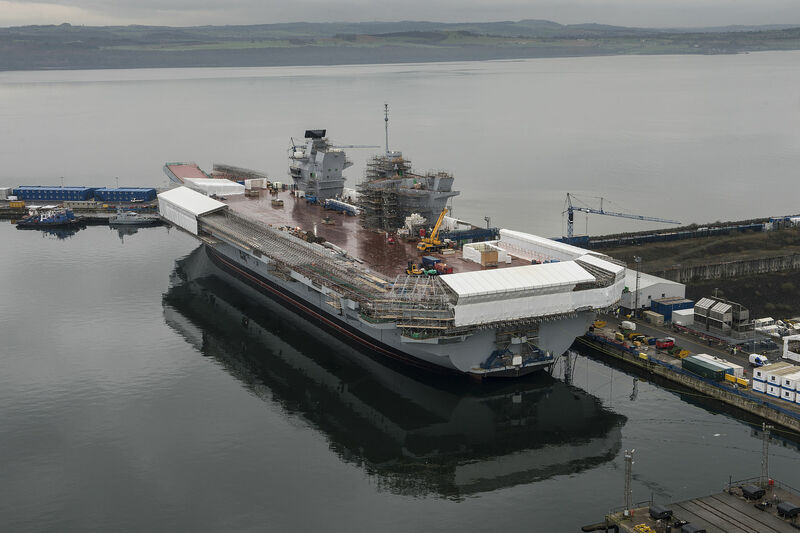 The first carrier, HMS Queen Elizabeth, is nearing completion. She is supposed to begin sea trials in 2016 and is planned to enter service in 2018. The air wing will include 2 or 3 squadrons of F-35B short-takeoff vertical landing variants (STOVL). However, the Brits won’t stand up their first F-35 squadrons until 2020 and 2021. So they will have a 2-3 year gap when they will have a combat aircraft carrier with no fixed-wing combat aircraft. What to do? ……..the HMS Queen Elizabeth, is in the final stages of construction and will begin sea trials next summer, with initial flight training in 2017-2018. But with the RN’s first F-35 squadrons not scheduled to achieve their initial operating capability until 2020 (at the earliest), the Brits are looking for aircraft that can embark earlier and provide a combat punch before their own Lightning IIs are ready for action. The U.S. Marine Corps will deploy its Lockheed Martin F-35B Lightning II strike fighters on combat sorties from Britain’s new Queen Elizabeth-class aircraft carriers, a senior U.K. Royal Navy officer has confirmed. “In order to get the best out of [the U.K. carrier program] we have to be able to situate it in a coalition context. That could mean that we operate with an American ship as one of the protecting escorts”, Blount said. “But … given the fact that the U.S. Marine Corps are buying and will operate the same type of aircraft as we are buying and operating, it would make no sense whatsoever if we were to close down the opportunity and potential of the U.S. Marine Corps working from this flight deck. While British pilots and ground crews are currently training on the Lightning II in the U.S., the first UK-based squadrons won’t begin forming until 2018. Without the Marine presence, the Queen Elizabeth would be little more than an over-sized helicopter carrier for a couple of years, until the RN’s first F-35 squadrons become fully operational. The interim combination could also provide a little more punch in places like the Persian Gulf and the Baltics, where the down-sized U.S. Navy is already stretched thin. As we’ve noted previously, the American fleet suffered a “carrier gap” in the western Pacific this summer, and for the first time in recent memory, there will not be a U.S. carrier operating this fall in the Persian Gulf. [Because 10 carriers is not enough. I know some people may find that crazy, but with naval assets, you have to divide total number in service by 3 to get the number always available for actual military duty. That’s because for every carrier forward deployed in some hot spot, you will have one in refit and one coming/going from a deployment. It’s not a hard and fast rule, and certainly navies can surge to forward deploy most critical assets at the same time, but not on a constant basis. If you have 10 carriers total, it means only 3-4 will be forward deployed most of the time. That’s why the Navy maintained an 18, then a 15, then a 12 carrier standard. 12 is really the minimum for what have heretofore been normal national needs] While the Queen Elizabeth is about two-thirds the size of a Nimitz-class carrier (and can embark no more than three dozen F-35s), it could be a useful gap-filler, or extend the coalition presence into areas where U.S. carrier groups aren’t patrolling. At one point, the British government contemplated scrapping the ski ramp/VSTOL aircraft combination for the Queen Elizabeth and its sister ship, thePrince of Wales (still under construction). Switching to a catapult/arresting gear system for launch and recovery would have allowed the UK to buy a more capable version of the F-35. But adding the catapults, arresting gear and related hardware would have stretched construction times and increased costs. With the Marine Corps already at IOC with the F-35B–and capable of operating from a ski-ramp carrier–the notion of embarking USMC squadrons on the Queen Elizabeth makes a great deal of sense. In order to pay for the carriers in a period of extremely austere defense budgets, the Royal Navy has had to accept extremely deep force structure cuts in almost every other area. Today, the Royal Navy has only 6 area air defense destroyers and 13 frigates in service. They have a single helicopter carrier for amphibious assault and two dock landing ships. There are only 6 SSNs and 4 SSBNs. The Royal Navy generally has less than 1/3 to 1/2 the major combatant force structure it had 20 years ago. Of course, they’re hardly alone in that, the USN is in much the same……….boat. Get it?! Much of that force structure was dumped, at government behest, with the promise: let us cut another half dozen frigates and you can keep your carrier. That happened several times. The very nice Sea Harrier FA.2 were retired way early as part of this process. BUT……having a “full size” carrier is probably worth the rest for the capabilities they provide. The Queen Elizabeth’s will be the largest warships ever to enter Royal Navy service. The RN is finally getting back to where it should have gotten with CVA-01 back in the 60s. Posted by Tantumblogo in Admin, awesomeness, Dallas Diocese, General Catholic, Glory, Grace, manhood, sanctity, secularism, sexual depravity, Society, Spiritual Warfare, Tradition, Virtue. I hope to see some new faces tonight! Not that I’m tired of the usual ones!